Losing hair can cause a lot of psychological stress and distress. It is estimated that there are about 100,000 hair on a woman’s scalp, so losing 100 of them in a day should not be a cause for alarm. Usually the hair loss in women is replaced by new hair that grows from the same hair follicle. But this changes with age and especially after menopause when a general thinning of hair occurs in the central part of the scalp, which is called female pattern baldness and related to hormonal changes and genetic predisposition. Further, women lose quite a bit of hair in the two to three months three months they take to deliver a baby. 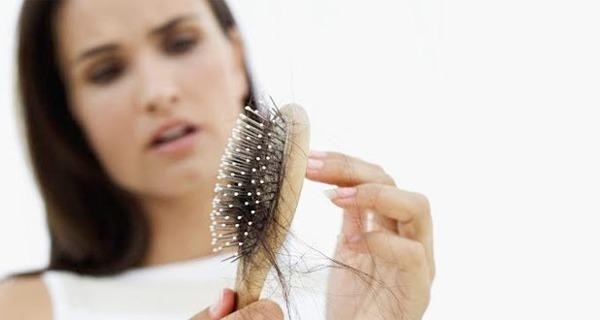 Other causes of hair loss in women are the result of severe stress, operations, infection, high fever and crash dieting with insufficient protein intake that result in hair coming out in handfuls. Cancer patients undergoing chemotherapy lose a substantial portion of their hair but it usually returns after the treatment is over. Other possible causes of hair loss in women are birth control pills that have high amounts of progestin, thyroid disease, bacterial, fungal and herpes infections of the scalp; improper hair care with tight hairstyles, overuse of dyes and permanents. Nutrient deficiencies like vitamins A, B6, B12, C, folic acid, and minerals such as copper, iron and zinc that make red blood cells which supply oxygen to the hair shaft to keep it vibrant. Vitamin E is also required for good scalp and follicle health. You need to identify the bad eating habits that are contributing to the increase of pitta in your body. Replace those foods with healthy alternatives especially ones that are rich in fiber and protein. You should eat sesame seeds in the morning. Mix carrot, alfalfa juice and lettuce juice or lettuce and spinach juice for aiding in hair growth. Drink lot of water. You do need to flush out the toxins that have accumulated in your body and drinking water is the best of doing it. To correct vitamin deficiency causing hair loss, women are advised to consume foods rich in vitamins. They should contain beta carotene, the major vitamins, vitamins C, E and minerals iron, zinc, copper, silica and free form amino acid complex. Thinning hair can be a sign of poor nutrient absorption stemming from insufficient stomach acid or bacterial growth in the stomach. Such women need appropriate doses of hydrochloric acid along with a digestive enzyme capsule to correct this condition. Some women have had success in using aloe by rubbing on the scalp and taking two teaspoons orally before going to bed. You need to use chemical-free products, i.e. avoid shampoos and conditioners. This is because they only contribute to the rise of pitta in your body. Use warm water to the level of your body temperature for washing your hair. If it is too hot, hair loss will be accentuated. Rinse your hair with boiled neem leaves after washing your hair. It helps to clean your scalp and promotes growth in hair follicles. Inverted asanas such as Sarvangasana that tend to reverse the gravity on the body are best suited for treatment of hair loss. They stimulate the flow of blood to the head. Make sure you pratice such asanas under the guidance of a yoga teacher. What you must additionally do is practice deep breathing exercises to control stress, anxiety and keep your mind balanced. Other scalp massagers to stimulate hair growth in women include arnica that can be applied in the form cream, ointment or tincture dissolved in warm water;jojoba oil, that may reduce hair loss when applied to the scalp, emu or kalaya oil is recommended as a moisturiser and root stimulant and promote hair growth; rosemary has been used for centuries to keep hair healthy and lush and should be used with almond oil, sage has been used for centuries by women fearing hair loss extracting it in the form of atea for massaging on the scalp; safflower oil has been known to be a good vasodilator and massaging it for twenty minutes a day stimulates hair growth. Massaging all of the above oils.improve blood circulation in the scalp and stimulates hair growth in women.